I used Grammarly to grammar check this post, because I ain’t near as smart as I think I am. Oh, before I forget, this is the first of the month, so pop over and read this month’s Hot Flash. I got an email from a very nice fellow at Grammarly, offering me a gift certificate to Amazon if I posted about writing with a link to Grammarly. 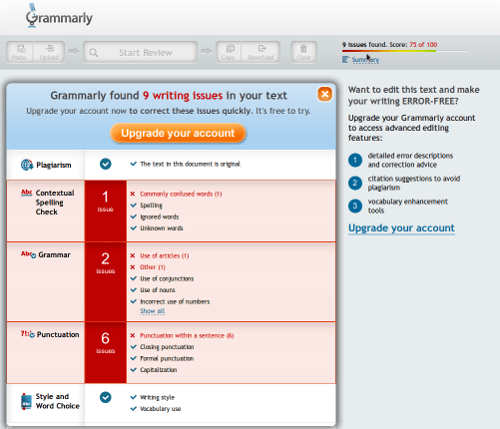 In case you don’t know what it is, Grammarly is an online proofreading service. You upload your text, run it through their editor, and their bot tells you what mistakes you’ve made and, it says here, helps you correct them. It’s pretty slick, and I can see why I might actually shell out some cash money to use it. I’m highly disappointed in their try-out, though, and here’s why. It isn’t but one thing in the world I’m afraid of, and that’s a English teacher. They useta be this one that th’owed a eraser at me ever time I said something the wrong way, and I seemed to always be saying something the wrong way. And wouldn’t you know, I was doing fine ripping off convenience stores and this one guy turns out to be a English teacher laid off or something? “This is a stickup,” he says. So I hit him upside the head with my gun. And now I’m doing extra time for assault and battery. Damn, I hate me a English teacher! Deliberately weak in grammar and usage, just to see what Grammarly would do with it, yes? So it told me, generally, what class of errors I had, but I couldn’t access the specific errors. Still, it’s good to know I really did probably write the story myself, and wasn’t channeling some yahoo. Well, thinks I, maybe I need to register for the free trial before I can try it. So I registered for the site, but guess what? You can’t sign up for a free trial without signing on for a paid subscription. You pay, you get a 7-day free trial, to see if you like it. At $29.95 a month, no thank you at the moment, but quite possibly later. I could choose a default style (Creative, in this case), which scans differently. My score went from 41 to 52 out of 100, because Grammarly excluded some “mistakes”, rightly seeing them as creative license. Of course, I can only assume it excluded the correct ones, since I still only had the generalized report. Finally, I cut and pasted this post, excluding the story, to see how that came out. 75? Now, that’s just hurtful. I subsequently got an email from the Grammarly site, saying that I could cancel any time during the 7-day free trial, but I had to input a payment method before the trial could begin. Still, would Little Miss Tightwad EVER want to pay $30 for a month’s use? After I’ve written a book, after I’ve run it past my beta readers, after I’ve done the rewrites, when I’ve looked at it so often I can’t see mistakes anymore, I need a dispassionate set of ocular input receptors to catch what the meat sacks have missed. If I didn’t have beta readers, a husband who’s a retired English teacher, or a mother who is death on errors, or if I wrote many novels a year, it would be worth it. If I were writing technical, business, or academic papers, especially several a month, it would totally be worth running them through a scan to catch and correct formal errors. The price per month goes down if you pay by the quarter, and way down if you pay by the year. A WRITING PROMPT FOR YOU: A character who believes he or she has done something perfectly is criticized by a stranger. This entry was posted in Monthly Update, Writing. Tagged flash fiction, grammar, product review. Girl! I absoloutely HATE those SCAMMERS who won’t give you an honest free trial of their crappy little S@*T! Of course, they know some of us only write a book a year and can free trial their crap on the once in a lifetime MS and they get no business subsequently. Boo Hoo! It’s like DRM or no DRM. Get your crap out there or no purchases. Right? ANyway, Hi. Lil Momma Cat is chugging along. Not fine, but still purring. Good lil girl. Way harsh, but not untrue. Got a very nice email from the Grammarly folks sounding like they might change that “give us your private information before we let you see our stuff” thing. I don’t think they’re scammers, but the process makes them LOOK that way, which is never A Good Thing. Steve, I don’t think $30/month would be insane if one used the service A LOT. Too pricey for what I would need, though, for sure, although 75 out of 100 makes me wonder…. You point out my biggest question, and the reason I’d want to try before I even THOUGHT of paying: The inevitable Grammar Jackass effect, in which rules are applied in situations in which they aren’t applicable, so that the writer has to know and understand the rule in order to benefit from the program that’s supposed to help him apply the rule. Mind you, if I didn’t have my critique group and my “use the possessive with a gerund” Mom, I’d be inclined to run my stuff through SOME kind of program. I guess I’m just cheap, Marian LOL! I’d never subscribe to such a service at those rates, however much I used it. Considering the fact that it”s automated, I can’t see that it’s costing them that much. The cost of hosting the website plus updating the software from time to time – neither of which need to be exorbitantly costly to them. I know a funny story about spell-check letting the inappropriate but correctly spelled word through in a manuscript a member of my critique group was reading aloud. The word was SUPPOSED to be “public”…. Thank you for this, Marian. It was most helpful. It reinforced my suspicions about these offers. I’m fortunate in having good beta readers and an excellent proofreader friend. Think I’ll stick with them! I’ve already fallen out of love with automated grammar checkers; the only thing I do automatically with them is turn them off. They might be very useful to people who wanted to use them to study grammar, using something as a basis they KNEW the intended meaning of. Might be very useful to people who were uncertain of a usage and wanted to run the sentence through, just to check. None of that would be worth the cost, though. It would probably be a better sales model to give it away free through a gateway of ads in the sidebar, like Facebook. 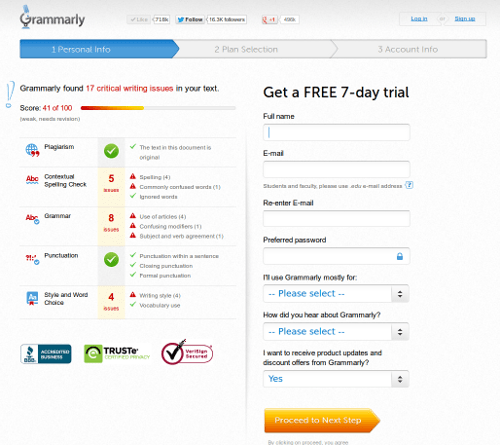 I have used grammarly as a paid account only, so never experienced the hassles one can face to avail a trial version. But I believe there are certain issues in writing which can only be mapped by a human. So, proofreading your document is a nice way to reduce the writing issues. Thanks. You’re so right, Aayna. There’s no substitute for experienced eyes connected to working brains!